While not technically in the OC, how often can you ride to -not 1 – but 3(!) chances to witness the world’s top riders competing in your own backyard – so to speak. 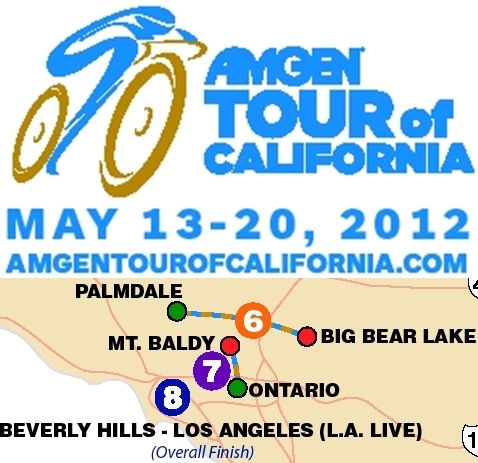 Yes, the Amgen Tour of California is back to SoCal! If you can afford to play hooky, or get the day off, here’s a real treat to see some of the best racers compete on the same roads you train on – Awesome! How funny is it that this stage is happening on the National Ride to Work Day? Which brings up this curious factoid; a commuter rides their bike to work to get paid, while a pro gets paid to get on their bike and work! Big Bear Lake is back on the race map, challenging riders to face a daunting Stage 6, which will feature the first of the race’s “Daily Double”: Big Bear Climb and Mt. Baldy. If the 2010 route was a killer, this slightly toned down route will be a crusher because following it is the 2011 mind numbing Stage 7 with its 2 KOMs, and a Sprint. Not to mention of course, the excruciating pain (for us mortals) of the switchbacks on the last mile to the finish. the mountain climbs on Friday in hopes they can survive the brutal ascent to Mt. Baldy on Saturday? Or will they match the move of their nearest rivals and let Mt. Baldy decide the ultimate winner of the Amgen Leader Jersey? Or will there be a standout star that is capable of attacking both the Big Bear Climb and Mt. Baldy? This entry was posted in Event and tagged bike, race, TOC by Pete van Nuys. Bookmark the permalink.